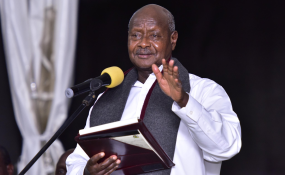 The parliamentary caucus in Kyankwanzi District unanimously endorsed the Chobe resolution by the party's central executive committee (CEC) to have President Museveni continue leading the neighbouring East African nation. "I'm therefore very pleased with your confidence in me and since I am still very able and I happen to be among the most conversant with this journey, I happily agree to serve," said the President, fetching a thunderous applause from the legislators who nominated him unanimously on Sunday. NRM Spokesperson Rogers Mulindwa, in a statement on Sunday, said the legislators' position was taken shortly after secretary-general Justine Ksaule Lumumba's presentation titled: Towards 2021: Milestones and Strategies for the NRM Party. He will battle it out in the 2021 poll with 37 year old MP Robert Kyagulanyi aka Bobi Wine and 62 year old Kizza Besigye, who has unsuccessfully tried to dislodge Museveni in Uganda's 2001, 2006, 2011, and 2016 elections.